Our columnist Stuart Lumb is known as 'Jet Set Super Vet' (JSSV), and he's living up to that with his latest update. Cashing in plenty of air miles, Stuart headed off to the paradise of St. Lucia to take part in the Tri St Lucia (www.tristlucia.com) event, organised by John Lunt. As his opening line says, there are worse places to be in November! I have never raced in the Caribbean before, but given I had quite a few air miles racked up, I figured it was a good way to use them up. It would also give me an excuse to wear my brand new GB trisuit (and give exposure to my generous sponsors; Du Pont – formerly Danisco, Cranswick (I love their numerous delicious pork products), and Yorkshire veterinary group, Vetsonic). The race in St Lucia (www.tristlucia.com) takes place at the sumptuous Landings Beach Resort, which is at the north end of the island and two hour's drive from the main Hewanorra airport. My journey out was quite eventful as I flew from Gatwick and the day before my flight the airport was evacuated, causing severe disruption, as a handgun was found in a waste bin. It's possible to book luggage in the evening before which was a boon given I was shipping my bike out in my much travelled, much repaired, SciCon bike box. Fortunately my direct flight left bang on time on the Sunday morning. 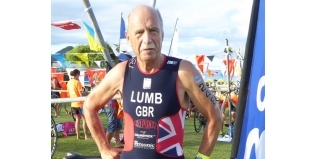 John Lunt, formerly of Human Race fame and now CEO of BspokeEvents.co.uk puts on three events in St Lucia; the Dagger, the Pistol and the Cutlass in conjunction with the St Lucia Triathlon organisation. The events can be entered individually or as part of a relay team. I had originally entered the Cutlass which was pretty well Olympic distance, but given my poor running and the humidity I went for the shorter (5km) run Pistol option. The bike split - biking is on the left, as here - for the Cutlass was only 13.2km. That might seem short but there are some pretty steep gradients on the course plus the temperature is around 30°c most days. John puts on a pre-race sports programme, part of which takes the form of workouts with former Olympic Decathlon champion, Daley Thompson. Being on the beach under the swaying palm trees did make it a bit less arduous though. I didn't participate in those, but I did take part in the aquathon – my first ever. In addition, John organises several varied social events, one of which was a day long trip by boat to visit the Pitons, a famous St Lucia landmark, which comprises of two volcanic plugs which soar over 700m above sea level. Race day dawned and I biked up to the Landings, a matter of a 10 minute ride from my hotel. No worries about getting cold while waiting in transition, but of course a non-wetsuit swim which for JSSV with my above average calves, (new nickname “Lead Legs Lumb”), was a big disadvantage, although the salt water does give some buoyancy. I was delighted not to exit the water last and then hopped on my bike. Because I was using my bike for transport as well as racing I opted to take my much loved 12 year old Trusty Giant TCR to St Lucia, rather than my relatively new Planet X N2A. My Giant is a great bike, with French made Mavic Ksyriums which are still as good as new. Downside is that rear cassettes in 2003 only had 9 cogs (vs. 11 on my new bike), so climbing was quite tough compared to the guys on bikes with bigger gears. (Just had a eureka moment, I must see if a bigger cassette would fit. Starting to get the hang of bike mechanics, it's only taken me 14 years!). The bike split was pretty lumpy, two laps and some gorgeous ocean views which I quickly glimpsed where possible and then it was on to the run. This was two by 2.5km laps, and it was nice that I was neck-and-neck with fellow GB Age Grouper David Crawford, who hails from Surrey (known to us from God's Country as "t'Deep South"). It's very unusual that I have someone to run with and it made a nice change, especially as I just managed to beat David by a few metres! As we finished the heavens opened, drenching all my kit, so it's worth packing a large bin liner for water proofing purposes. Crazy as it might seem, I had to have a hot shower when I got back to my hotel to warm up, as the air temperature had dropped by around 10°c. John had the times and splits practically as we crossed the finish line which was most impressive. The entrants varied widely in terms of ability and kit, ranging from pointy helmets and Cervelo's to competitors making sterling efforts on MTBs. There were entrants from a vast array of different countries with many locals competing. John also puts on with the St Lucia Tri Association events for the youngsters, including a special needs event, which is highly commendable and it was great to see the kids having their first taste of our wonderful sport of triathlon. Who knows, in a few year's time we might well see them gracing the Olympic stage.